This year, many districts are replacing state standardized tests with PARCC or Smarter Balanced, two Common Core-aligned assessments designed to measure college readiness. Testing for 21st century skills and depth of knowledge, these assessments aim to give administrators and educators a better understanding of individual student need, skill levels, and academic growth. PARCC, the Partnership for Assessment for College and Careers, currently requires a speaking and listening assessment and two summative assessments that measure a full range of standards to determine college and career readiness. In these fixed-delivery assessments, students are tested in reading comprehension and asked to write equations, graph functions, draw lines of symmetry, and create bar graphs. 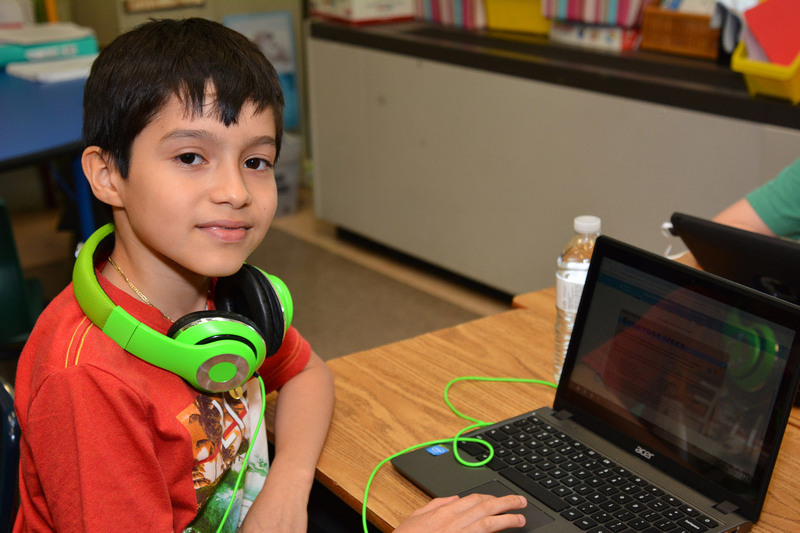 At the start of the school year, districts that use PARCC have the option of taking a diagnostic assessment that provides teachers and parents with timely information about each student’s knowledge and skills. 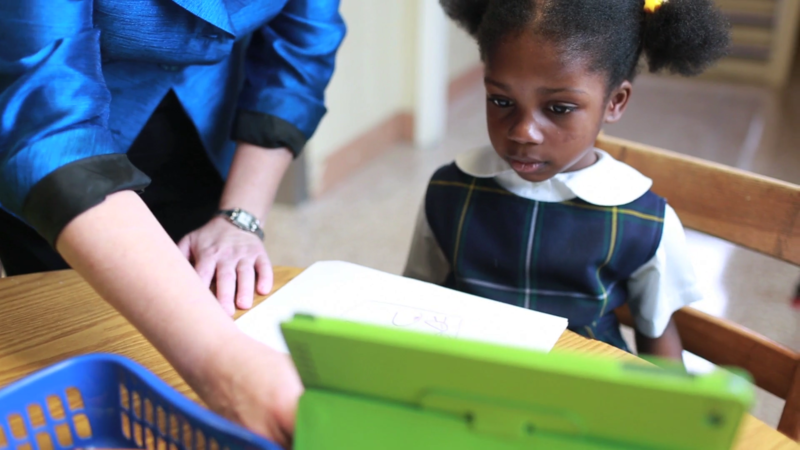 The results of these formative tests can help inform lesson plans and PD sessions. Schools using PARCC have the option of taking a mid year assessment as a means of monitoring student growth. PARCC is still in its early stages, but some schools are already opting out. Parents and administrators have expressed concern that PARCC may be too difficult for students used to standardized state tests, and some schools do not yet have the technology for students to successfully complete PARCC’s computer-based assessment. Still, in the 2014-2015 school year, over 5 million students participated in PARCC testing, and this rigorous testing of college and career readiness may allow schools to provide targeted support and intervention to students who struggle to grasp Common Core standards. 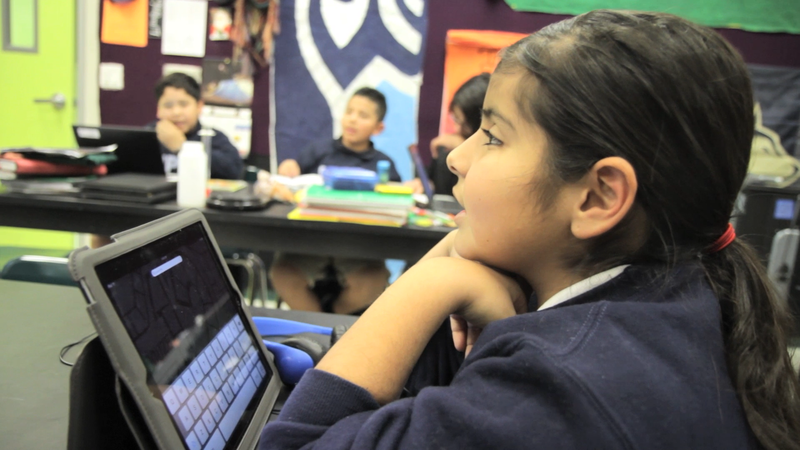 Like PARCC, Smarter Balanced was developed to ensure students are college and career ready. While PARCC uses a fixed-delivery method, Smarter Balanced is a shorter, adaptive test that tailors itself to the skills of each student. If a student is performing poorly on a Smarter Balanced assessment, subsequent questions get progressively easier until a student answers correctly, and if a student is performing well, his or her questions get progressively harder. Smarter Balanced offers optional interim assessments that are meant to provide educators with data about students’ academic strengths and weaknesses. During the last 12 weeks of the school year, Smarter Balanced administers a summative assessment consisting of a computer-adaptive test and a set of non-adaptive performance tasks that require students to use multiple Common Core skills. Software aside, these tests include questions far more complex that the traditional multiple choice questions that most students are used to. Despite the backlash, legislators have determined that PARCC and Smarter Balanced will eventually factor into report cards and teacher reports, and many educators are scrambling to ensure that their students can demonstrate significant depth of knowledge. Developed by researcher Dr. Norman Webb, depth of knowledge is a way of measuring the type of thinking required to answer a question in an assessment. The simplest assessment questions ask students to recall or reproduce material and have a depth of knowledge level of 1. Questions that tests concepts and skills have a depth of knowledge level of 2, and questions that require strategic or extended thinking have a depth of knowledge level of 3 or 4. While most state assessments test students’ capacity for rote memorization and basic skills, PARCC and Smarter Balanced feature DOK level 3 and 4 questions that ask students to synthesize multiple Common Core skills and carry out intellectually rigorous tasks such as analysis, creation, and modification. Schools looking to ensure college and career readiness in their students should consult the following DOK chart when updating their curriculum. In an effort to simplify lesson planning for teachers, we’ve aligned Webb’s DOK to the commonly used Bloom’s Taxonomy. 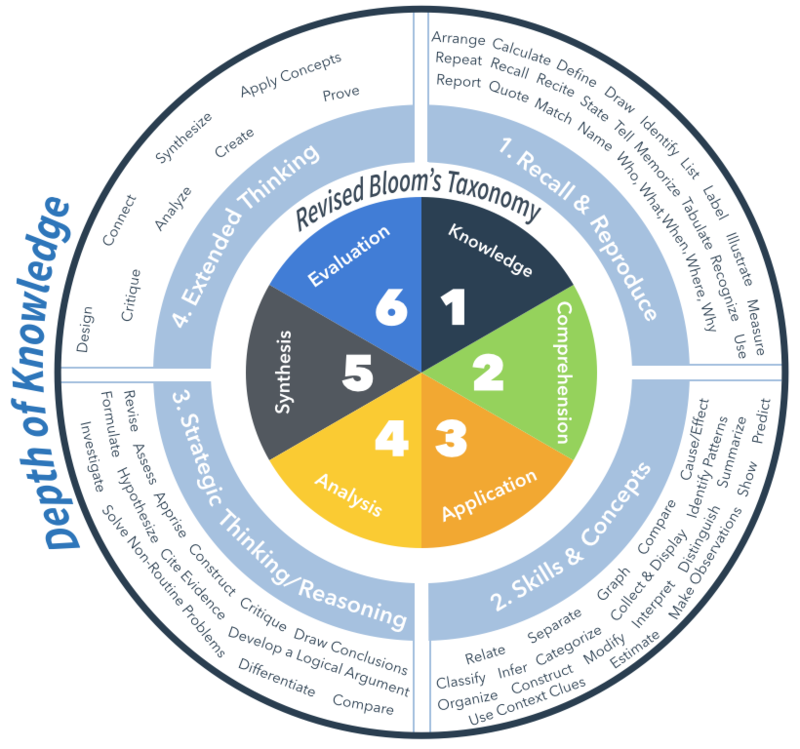 Bloom categorizes learning into 5 distinct categories: Knowledge, Comprehension, Application, Analysis, Synthesis, and Evaluation. Most educators try to touch upon all 5 of these categories in their lesson plans. Webb categorizes depth of knowledge (the thinking process) into 4 levels: 1) Recall and Reproduction, 2) Skills and Concepts, 3) Strategic Thinking, and 4) Extended Thinking. Overlaying Bloom’s taxonomy with Webb’s DOK chart stresses the importance of activities that encourage students to Analyze, Evaluate, and Create. To help you plan lessons that prepare your students for the next generation of assessments, we’ve included a list of words that are commonly used in activities requiring students to engage in complex thought. As a reminder, in order for students to answer questions with a depth of knowledge level of 3 or 4, students must first be able to remember, understand, and apply the material that is being taught. In addition to testing DOK, PARCC and Smarter Balanced ask students to use 21st century tech skills. 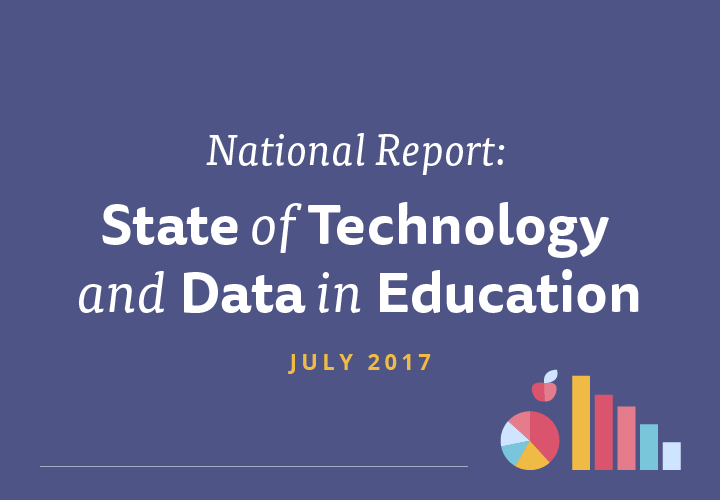 The rise of computerized testing has made blended learning an invaluable strategy to getting students on track for college or a career. 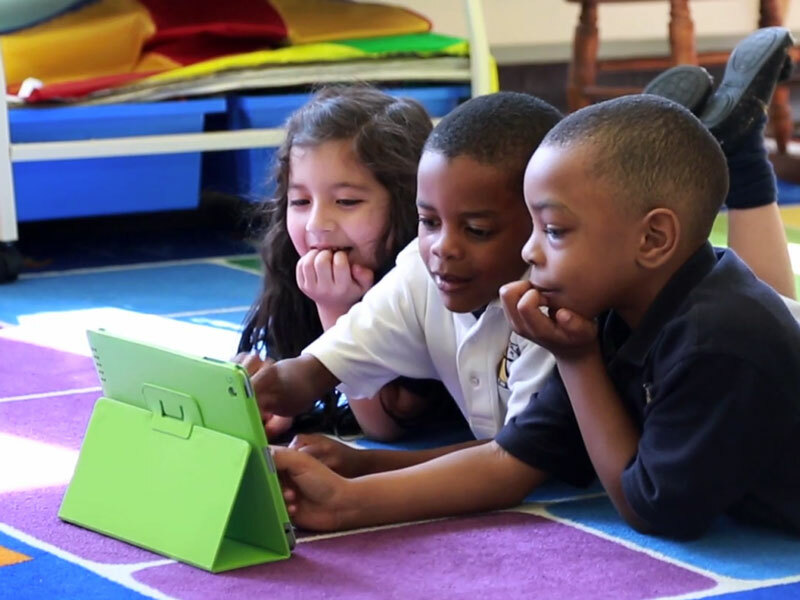 iPad initiatives can be especially beneficial to students who are struggling to keep up with Common Core standards or who lack web access in their homes. Want to make sure your students are developing the 21st century skills required by the next generation of assessments?